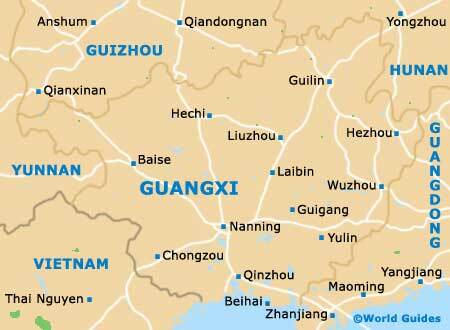 Roughly translated, Guangxi means the 'wide province'. It is certainly an accurate description for this once remote and mysterious part of China. Compared with other Chinese provinces, Guangxi is still seen as something of a backwater, despite the fact that the Vietnam War brought some level of economic development to the area. Nowadays, those tourists who do venture to Guangxi are generally drawn by its beautiful mountain scenery. Places like Yangshuo and Gullin feature on many itineraries. Gullin, in particular, has a unique hillscape that is marked by karst formations and rice terraces. It is easy to see why such a landscape has caught the eye of many an artist, as well as the occasional film director. Gullin has featured on the big screen on a couple of occasions, most notably as a backdrop in 'Stars Wars Episode III: Revenge of the Sith'. That said, on humid days it can be rather difficult to fully appreciate the amazing views. The south of Guangxi tends to be less busy than the north, with many tourists not having yet discovered the delights of its beaches, or for that matter, such attractions as the Detian Waterfall, which straddles the border with neighbouring Vietnam. The capital city of Nanning is also located in the south of Guangxi. With its parks and a distinct predominance of lush green foliage, Nanning is widely thought to be one the 'greenest' cities in China. An especially attractive Chinese city based around the Li River, Guilin is known for its surrounding lakes, mountains and natural limestone formations. River cruises are popular, with tour operators aplenty in the city.